Good morning lovely people, and welcome to my post for Julia's What's on Your Worktop Wednesday desk snoop. Do visit there when you have finished looking here. 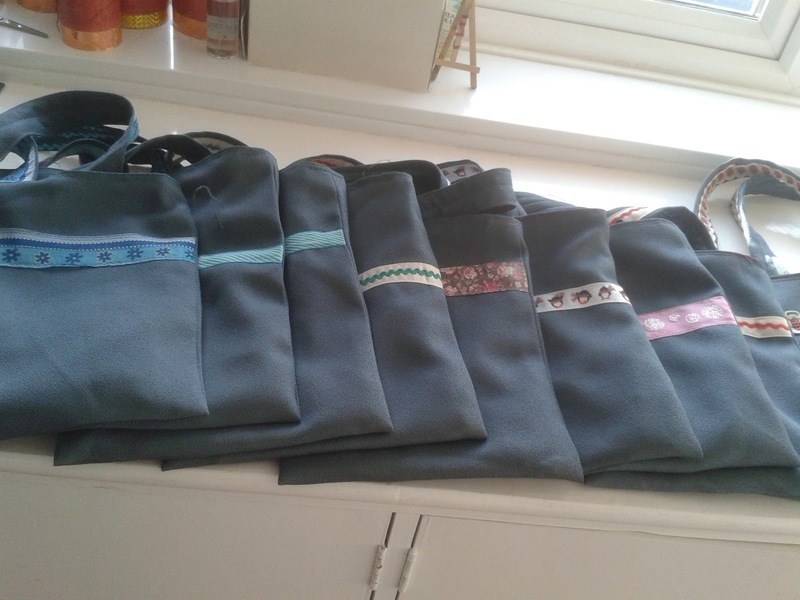 So on my worktop, first thing this morning, are 10 bags I've made for Margaret, for the school children in Uganda. 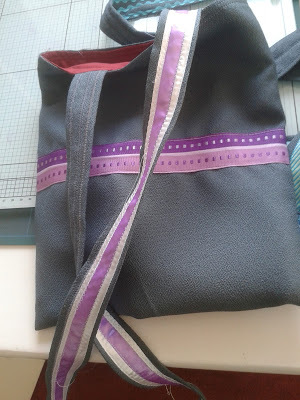 I haven't done anything in the way of card making since last week's blitz, but the bag with purple trim became part of a sort of mixed media project. and lots of messy fingers, and I had the perfect purple coloured ribbon for the strap. 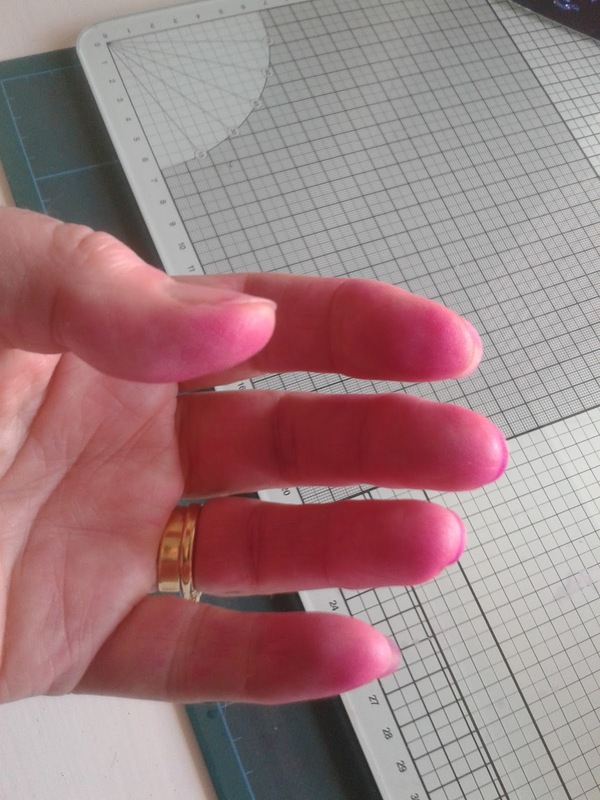 This picture doesn't actually show the colour of my finger, they were much more purple than they look here. So was my nice white work top, even with the glass mat and the big cutting mat underneath, so I had to spend 1/2 hour with bleach getting the marks out of the painted surface. I am such a messy person. Bless you for visiting and thank you, in advance, for all your comments, I will get back to anyone who leave a number. Now that is a good idea and It looks like it blends beautifully. Lol, only crafters will understand your panic! The purple ribbon looks great, as do all the bags - you'll still have purple fingers next Christmas, I reckon! Good morning, Chris. Thank you!!! Those bags are absolutely brilliant... the children are just so very thrilled to own one - something of their very own - not shared with anyone else, and a Bible inside. Sorry about the fingers, though - oops!! We are in all day today, although I have to pop to the shops tomorrow. If you arrive and there is no car, call John before you ring the bell. He'll come down for you then. Thanks for the visit already. I linked then went and got John's meds going, so only just getting round to folk. Trust the w/e away was a good time. The bags are fabulous and you've made so many too, you must be counting them in your sleep! That's a great idea about the ribbon, I often stain white ribbon, you can get the exactly colour you want then. I'm sure the bags will be greatly treasured by the children. Isn't it wonderful what mistakes we crafters can manage to cover up? Great bags and a wonderful thought process to match up the ribbon - very clever thinking. How long will that purple take to come out? Love the bags. They are very nice. I bet the children will love them. Chris - thanks for stopping by and also telling me about Margaret. Tell her not to fret - I appreciate her visit. I sometimes can't comment on some blogs and I don't know why. I so appreciate you letting me know about her visit - tell her thanks! Hi Chris, Fab bags for the school kids. 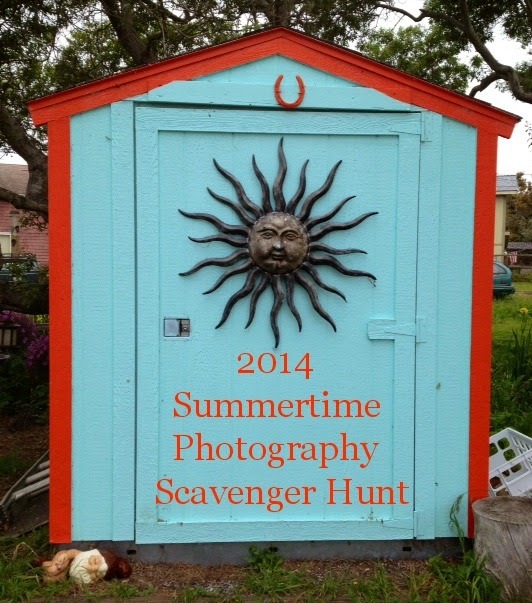 Did chuckle at your coloured fingers:) Fab idea though. Thanks for dropping by earlier and for your lovely comment. Messy person, you make me feel at home! I missed this one, Chris - love the bags, and well done rescuing the project even at the price of inky fingers! Think of them as a badge of honour! Thank you for your visit and your lovely comment. We were so relieved that Phoebe turned up again after we'd been thinking the worst! 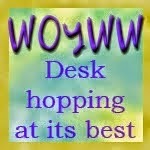 Happy WOYWW even though you aren't showing your desk this week.